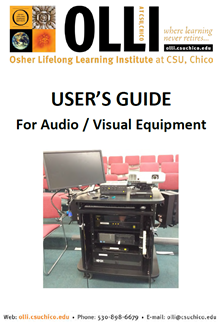 Since March 2015, our OLLI chapter has provided a professional quality multimedia system in each of our four major classrooms in Chico – Gordon 1, Gordon 2, Bradley, and Chico New Thought Center. The multimedia system is tightly integrated and provides high-definition, high-resolution video and audio signals that are all easily controlled by peer leaders from the front of the cabinet. Prior to the beginning of each semester, the classroom support team will provide a REQUIRED orientation and training for peer leaders who plan to use the audio visual equipment. This training is necessary to help you be confident and proficient in using the full range of capabilities that are available. The training will be focused on using the equipment. Peer Leaders are expected to be proficient in your own presentation materials, e.g., PowerPoint, Prezi, embedded video, etc., but we will teach how to use the OLLI computer and projector to show the peer leader’s completed presentation. Other Classrooms: Audio visual equipment availability outside the four main classrooms is very limited. Please contact the OLLI office for specific information for other classrooms. 1. We installed Apple TV devices in the carts in Gordon 1, Gordon 2, Bradley and Chico New Thought Center classrooms and it's available to those proficient in using a Mac computer, iPad, or iPhone and who have gone through a REQUIRED training to learn how to use the device with our projector and audio receiver system. 2. Flash drives work best. We have learned this lesson thousands of times in the past four years. Bring your presentations and other materials to class on a flash drive and simply plug it into our Dell computer in the multimedia cart. This is fast, easy, and much less hassle, especially for non-tech people. Seasoned peer leaders normally load and bring a backup flash drive for insurance. 3. Not sure whether you will be using the multimedia in your class? We recommend that you come to one of our trainings to check out the setup. It is very high quality and much easier to use than previous OLLI equipment collections. Bring samples of your presentation materials or files so you can practice with them. We want you to reach the point that you are comfortable and confident that you can operate the equipment by yourself if you decide to add multimedia to your teaching. 4. We require all of our Peer Leaders to use the voice amplification equipment (where available) for the benefit of our members. It is frustrating to be interested in class material but not be able to hear. 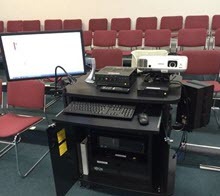 Our A/V training will give you practice with the microphone, wireless transmitter, and speech amplifier.